First and foremost – no, I have not reached unsavory new levels of things I’m doing to attract readership (we’re also not giving any free iPods). Though hey, if you’re already here, why not stick around? 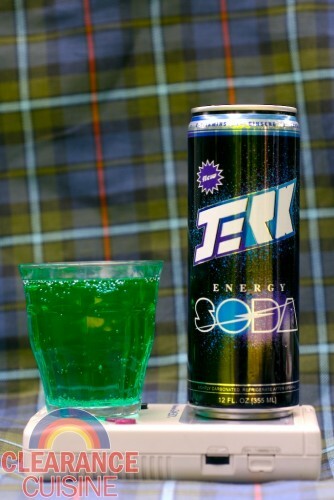 Jerk Energy Soda is just another foray into the over-saturated and over-caffeinated energy drink market. 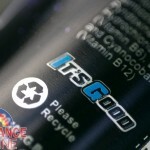 While there’s a new energy drink born every minute, this one piqued my interest pretty much solely for the name alone. Plus it’s got some 80s era retro gaming style graphics so I figured the 50 cents price tag was reasonable. Also I get to say the phrase “Jerk Juice”. Heh…jerk juice. The only input I got about this drink beforehand was that the gal at the store told us it “tasted like Sweet Tarts”. With 36g of scrumptious sugar per can (regular Coca-Cola has 39g, for reference), I figured it really couldn’t taste like anything besides candy. 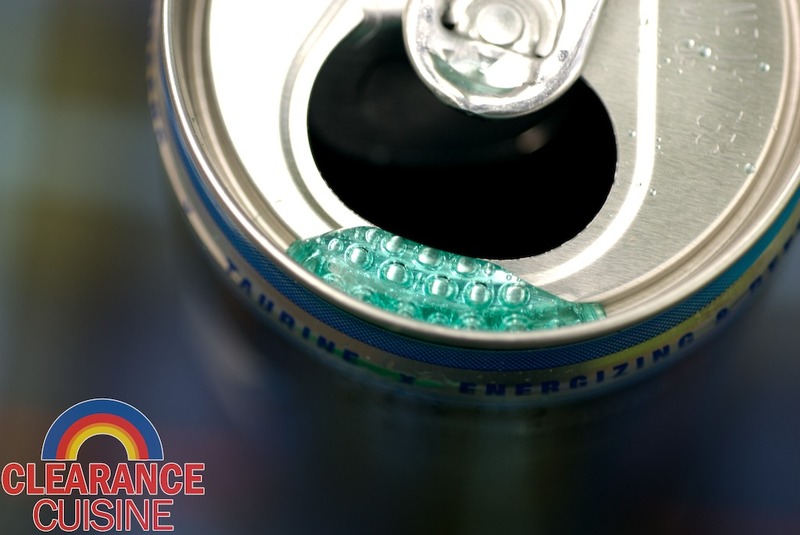 While most energy drinks are a fluorescent, doctor-shocking urine yellow, Jerk’s got a nice blue-green color to it (blue whens it comes from the can, green in the glass, so I figured I’d have some wacky light refraction action going on in our photo). I was secretly hoping it’d be purple though. All in all, not a terrible drink for 50 cents a can. While I would enjoy a diet version since more sugar is the last thing I need (though artificial sweeteners probably aren’t much better), Jerk has a decent taste for what it’s worth. I might just buy a few more cans and get my jerk on again in the future. 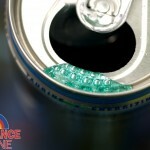 This entry was posted on Monday, June 27th, 2011 at 12:18 pm	and is filed under Drinks. You can follow any comments to this entry through the RSS 2.0 feed. Both comments and pings are currently closed.